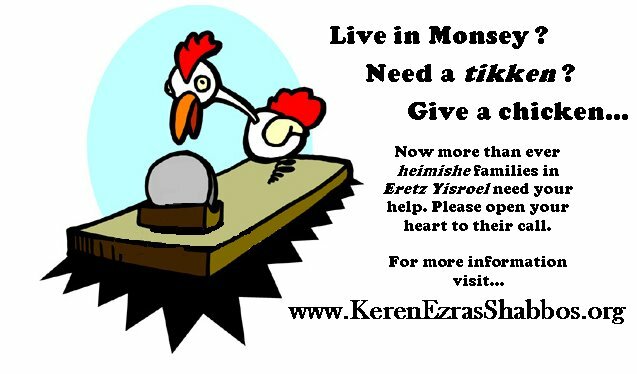 Keren Ezras Shabbos, an organization that supposedly helps needy families for Shabbos, has decided to use the Monsey treife chicken tragedy to help them raise funds. The image below, which is in obvious bad taste, was posted on their site to hopefully persuade the people of Monsey, whom have been Nichshol with treifos, to donate to their cause. I wonder under what fuzzy logic this organization thought this would actually help them. "I wonder under what fuzzy logic this organization thought this would actually help them." Let's stop and do the math together. Instead of being choiteh with a chicken, the person can now do a mitzveh with a chicken. I can't say this campaign would draw me to give, but the logic is there. What do you have against them? They might even cause some people to do a mitzveh. I do not see it anywhere on there site. Some people have no shame. Can you spell shnorrer? The same generation that "has no shame" in refusing to help mishpuches for Shabbos, is the same generation that is nichshal in tarfes rachmune litzlun! There is no shame in asking people to be mishtatef in a mitzveh! It is shameful to knock them. After 120 you'll be ashamed to show your face in shumayim. can we spell, "we are stupid"? what drives you to think that a chicken @ yomim noraim is necessarily related to Monsey? particularly since most of the country has never touched Monsey chicken. i would suggest that we ALL need tikun, especially if we read this blog! As someone who knows Keren Ezras Shabbos, I can vouch that it is a legitimate Tzedakah organization. It is run by people who have other things to do with their time and thus do not have to shnor to earn a living.